THERE WILL BE no changes to the operation of the two Dáil bars the Oireachtas Joint sub-Committee on Administration has confirmed. In a letter to Sinn Fein President Gerry Adams TD who had written to the committee questioning its operation, the committee said that they had agreed that “the status quo should remain in respect of the Dáil bar”. In relation to the bar licence issue the sub-Committee was informed that the Oireachtas is exempt from the requirement to hold a bar licence and is operated on the basis of parliamentary privilege. The existence of the Dáil bar has been subject to particular scrutiny following a number of late night sittings when the bars remained open, such as the night of the abortion debate last July and the night the former Anglo Irish Bank was liquidated as part of the promissory note deal last February. TheJournal.ie revealed that on the day and night the Protection of Life during Pregnancy Bill was debated, €7,000 was spent in the two bars located in Leinster House. The infamous ‘lapgate’ incident involving Fine Gael TD Tom Barry and party colleague Áine Collins also occurred that night, with Barry admitting that he had drank “a couple of pints” before it happened. 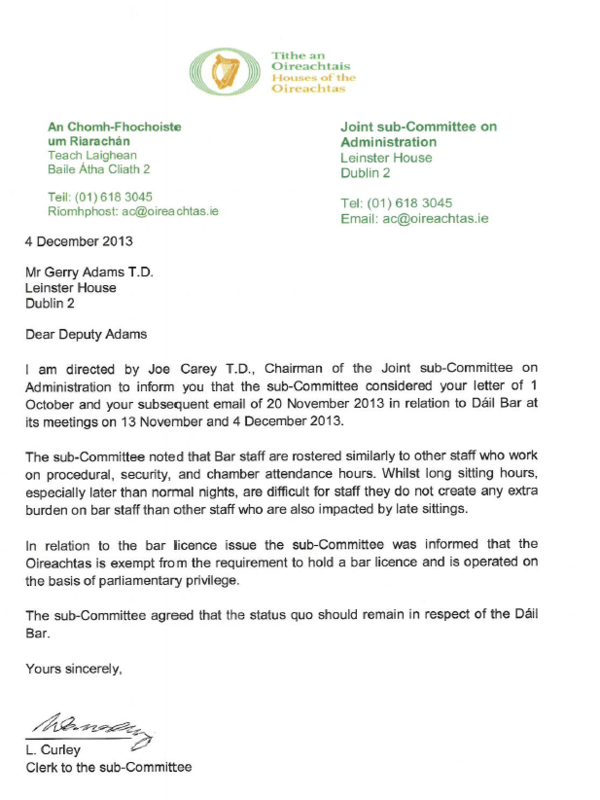 The letter to Adams also stated that although the late night sittings can be “difficult” for bar staff, it is not more difficult for them than other Dáil staff. Adams said this evening that he has raised issues about the operation of the bar with the Ceann Comhairle and with a number of Leinster House Committees and that this response “does not deal with the issue”. 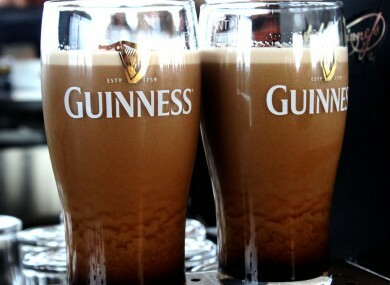 “Most people would find it odd that a bar can serve alcohol until all hours in a place of work. For this to the case in the Dáil ,where important legislation affecting the lives of citizens is being debated, is unacceptable,” he said. It is a further example of the cosy, insider political culture that has existed in this state for many decades one where politics is all about special privileges, cronyism and where standards observed by average citizens don’t apply. It’s time this culture was rooted out. “The Dáil Bar should be regulated the same way as any other bar and I intend to continue to pursue this issue,” he added. Email “Dáil bar is exempt from holding a licence and its operation will not change”. Feedback on “Dáil bar is exempt from holding a licence and its operation will not change”.